We are proud to announce Infinity Creations' store at Society6. You can buy a growing number of original prints available on many products such as iPhone and iPad cases, t-shirts, hoodies and even shower curtains! Head over to Society6 for more information. Joe's Tree available at Society6 right now. This work was inspired by my brother in law's cabin in Big Bear, California. This great colour combination is a sageo for the Ken Shin Kai kendo, jodo and iaido dojo here in Brisbane. Click here for more information about Ken Shin Kai. This pattern is Hira-nami-yatsu or flat waves eight. Here is a new sageo in the Chinese pattern that I am working on now. It is four colours though the dark colours do make a nice blend. Colours are navy blue, carmine, black and red. I have been experimenting with two kinds of flat braids. The first is an eight tama himo called Hira-nami-yatsu - flat waves eight from Comprehensive Treatise of Braids I: Maru-dai Braids by Makiko Tada (Japan) The left group was made using cotton embroidery floss and I experimented with the positions of the colours so create three different results. The one on the right was made using variegated silk from Japan. Oh I wish I could create all my braids with this silk! It is so lovely to work with and even mistakes look amazing! 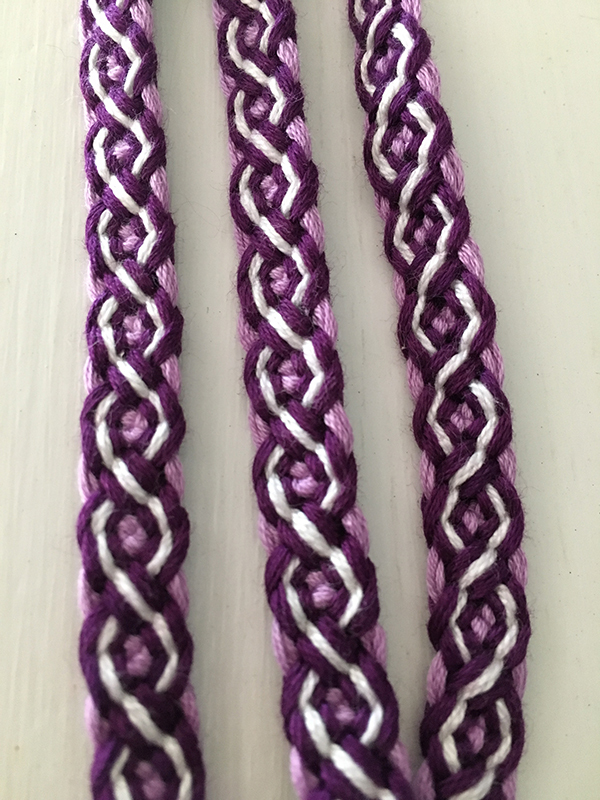 The second flat braid I have been making is from a pattern called a Chinese braid that I changed a little to create each side the same. Except for the one on the left - one step was removed and it created two different sides. This braid is made using 16 tama and a little more tricky to get the tension just right if all of your tama are not the exact same weight. I think this is the one I will continue to experiment with as it would look good as a sageo once the colour combinations and positions are chosen. Again, the one on the right is Japanese silk the others a combination of cotton and rayon floss. During my trip to the US recently I discovered a new way of capturing the essence of an image. 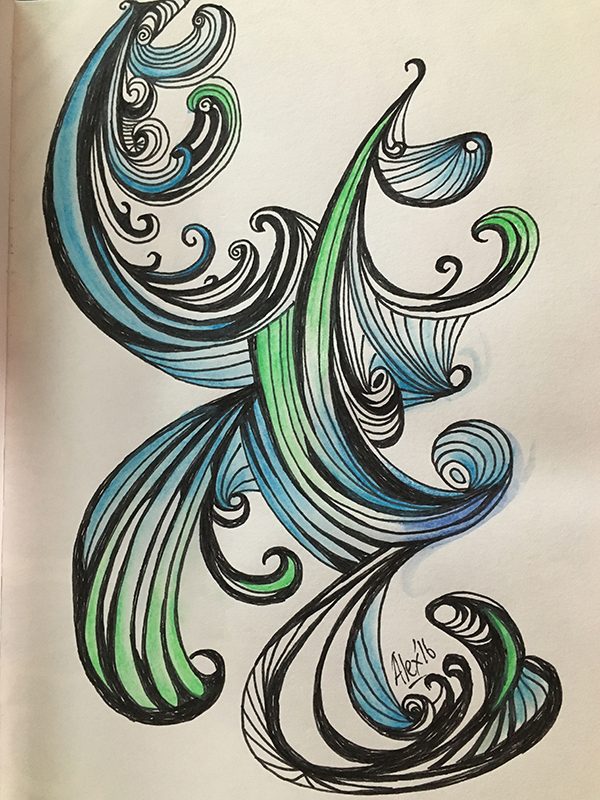 For a change I was deliberate in my inspiration instead of mostly eclectic (and possibly forgetful) in where I found initial inspiration for a piece. Below is the final work on the left and the initial inspiration on the right. Some of the pieces have yet to be coloured and some may just stay black and white. 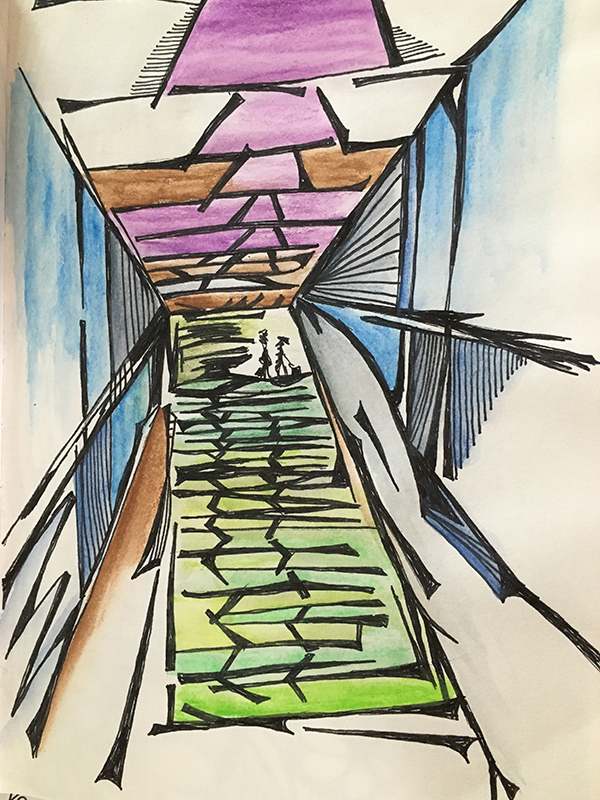 This piece was actually started while waiting for the plane at the airport. 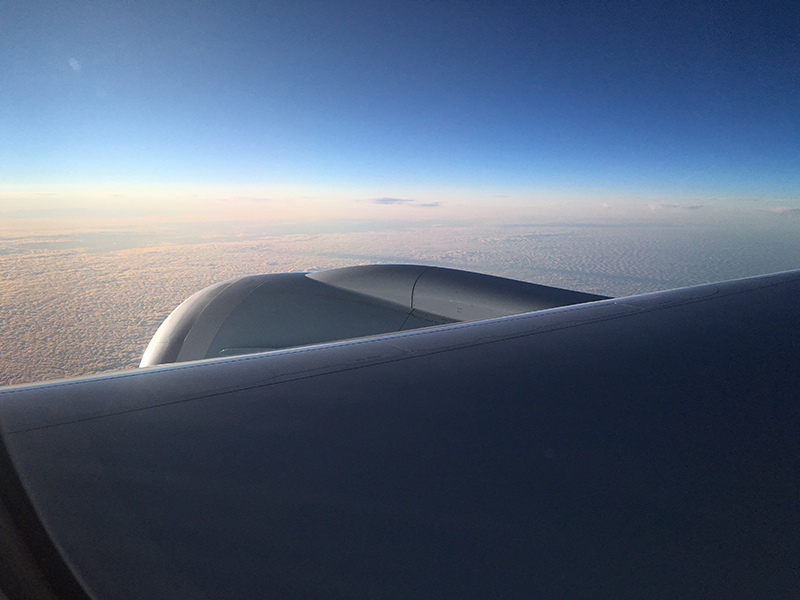 Once I saw the clouds from the window of the plane, as uninspiring as they may seem in this photo, I could see the swirls I was trying to capture. The walk through the airport in Vancouver was quite long but I liked the endless lines in this image. On the way from the airport to the city we passed the port with its many container cranes. I really thought they looked like giant, alien giraffes! During our stay at the University of Puget Sound in Tacoma, I was able to wander the grounds and found many an inspiring image. I think you will agree that this one moved way beyond the initial inspiration. This photo was actually an accident as I was putting my phone in my bag. I really liked the shapes though. This one may not be finished as I think it might need some colour. I am sure this view of the Seattle Sky Needle from the Chihuly Gardens has been used as inspiration before now. I am not sure this one needs colour so maybe I will colour it in photoshop as I can undo anything that doesn't belong. On the bus ride from Seattle to Tacoma we were stuck in traffic but it didn't really matter with a view of Mt Rainier out of the window. You can just see it in this photo near the centre of the windscreen. There were so many amazing trees and buildings on campus and I have so many photos for further inspiration. This one may spawn a series of prints because I find the shape of the branches just fascinating. 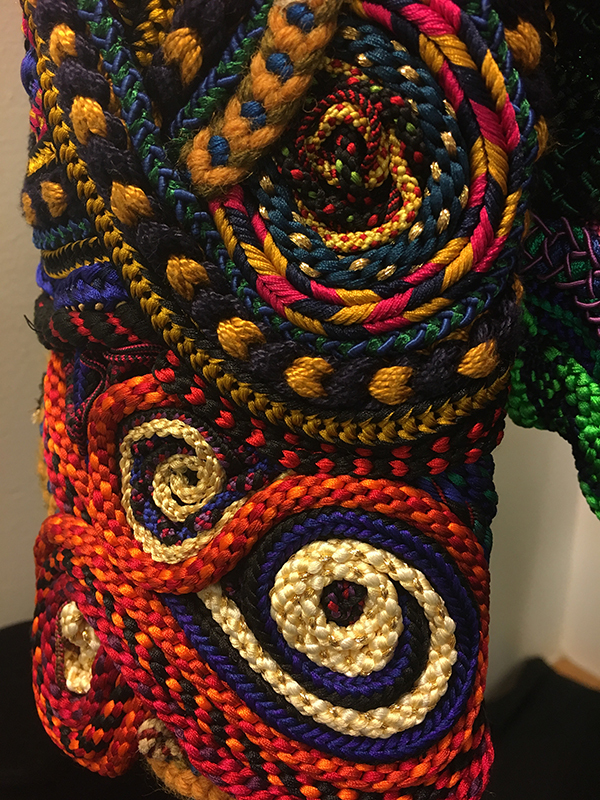 I was lucky enough to accompany my mother recently to Tacoma, (near Seattle, USA) for an amazing braiding conference, Braids 2016 - 'Braids, Bands and Beyond'. Not only did I learn some wonderful new techniques, I was able to meet one of my favourite artists, Jacqui Carey (photo of Jacquie with Rodrick Owen below right. Both legends in the braiding world!) 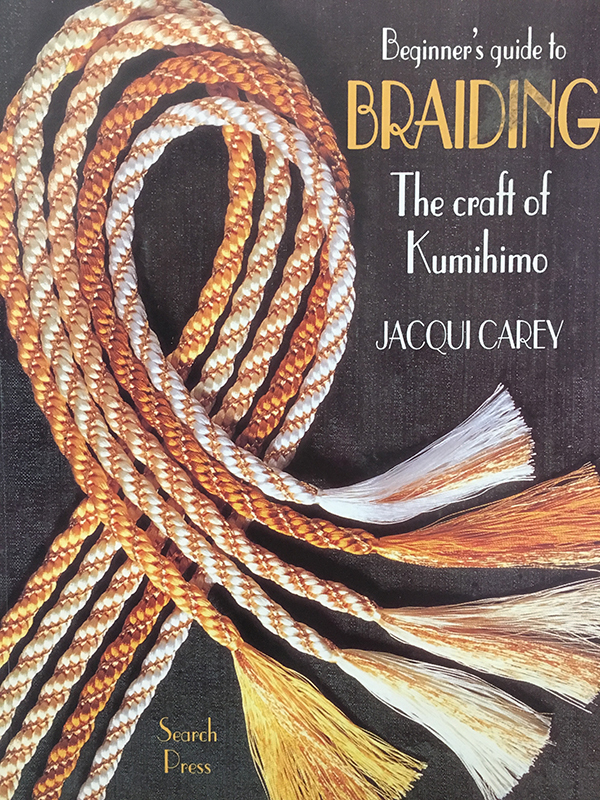 It was Jacquie's book that taught me how to braid using kumihimo on a marudai and I have made many sageo since. 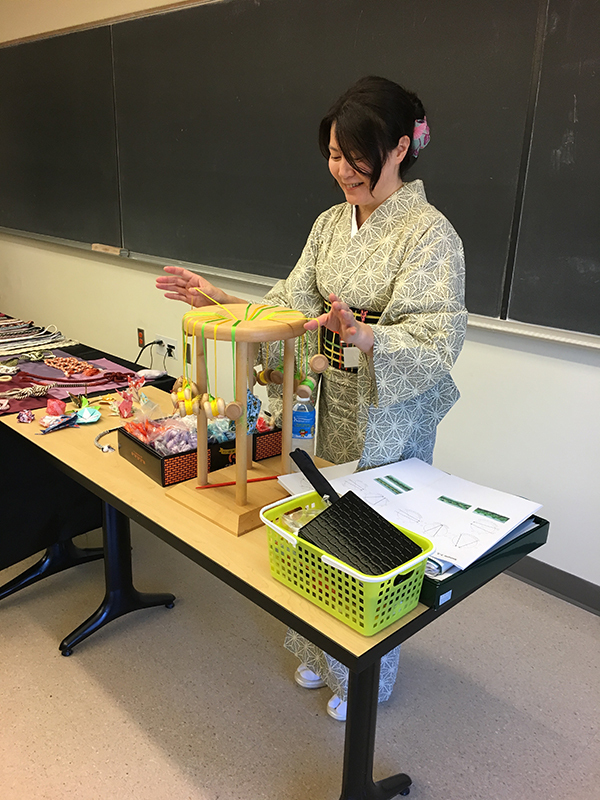 It was a privilege to be a part of one of her classes during the conference and her ideas have inspired me to look at braiding and braiding outcomes, in a totally different way. 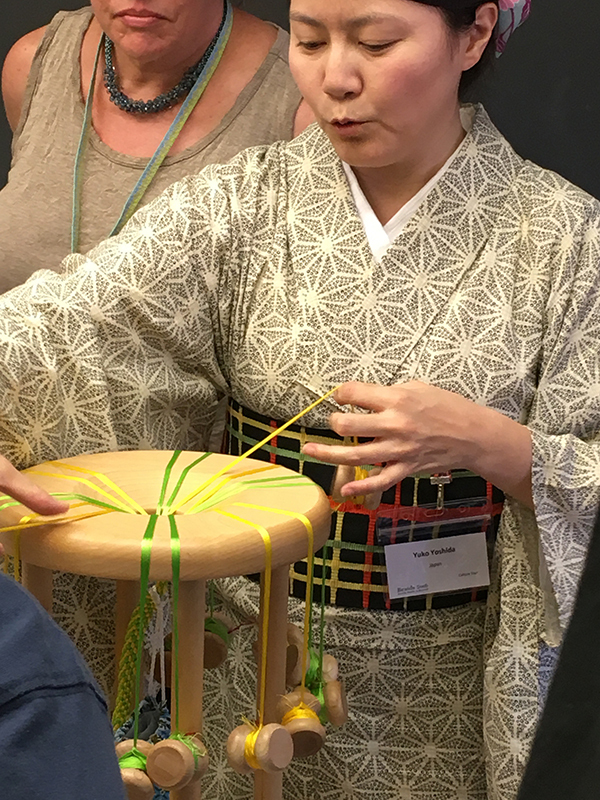 Kumihimo offers so many patterns to produce infinite possibilities. 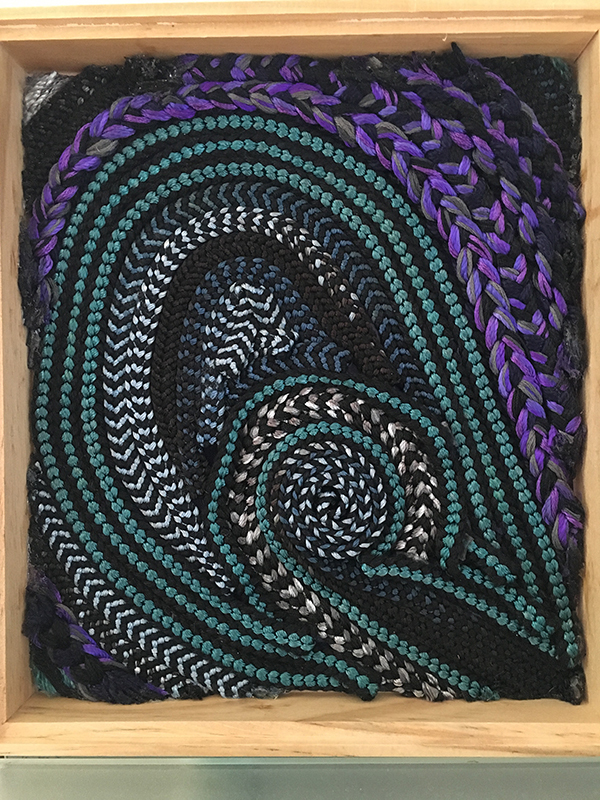 Jacquie's class encouraged the use of just one pattern on the marudai, a simple square braid, and by changing one variable at a time we were able to create so many different braids. Possible variables we experimented with were - differences in weights (the ratio between the counterbalance weight bag and bobbin weight); number of bobbins on each quadrant of the marudai (creating asymmetrical braids); amount of thread on each bobbin; adding a twist to the bobbin during braiding; adding a tight tug on just two of the bobbin at the end of each sequence of movements and surprisingly enough, how the braider was feeling while braiding. This last variable was a bit of a surprise to me and I was dubious that it could even play a part the final outcome. At every new change in our braid we would put in a marker, you can see in the image (above centre) that mine is a red yarn, so we could compare each change and affect. 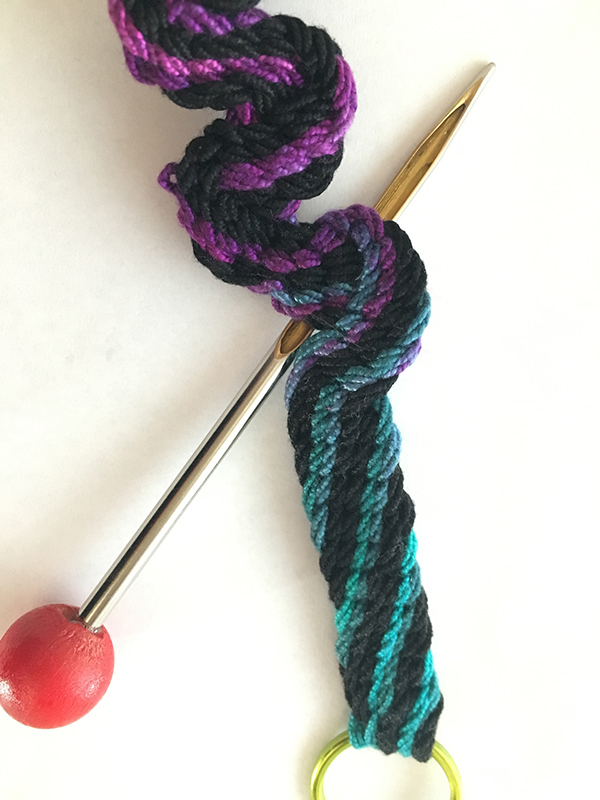 My braid using the regular square pattern created first thing in the morning was compared to the same pattern created just after lunch. For me there wasn't a huge difference but for some of my class mates there was a marked difference. 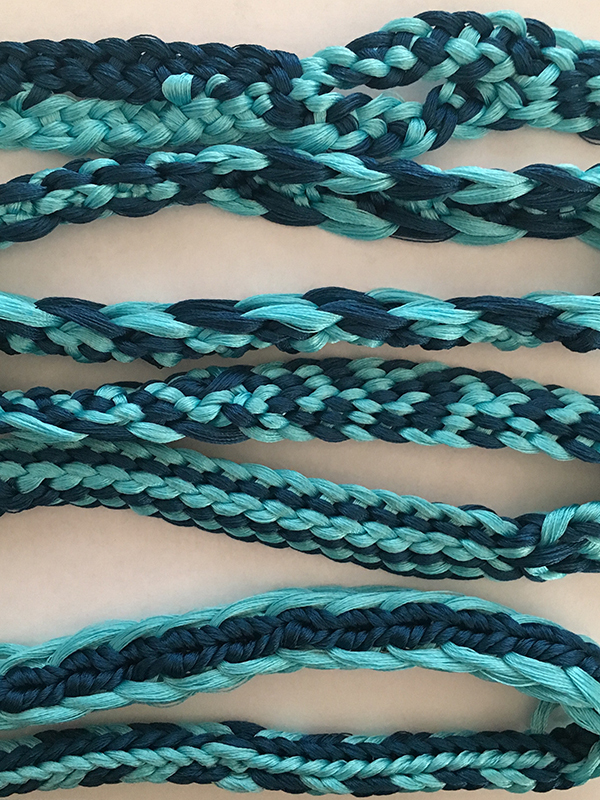 Perhaps mine remained uniform because I usually create an entire sageo (2.5m in length) in one sitting and the entire braid must be uniform, regardless of how I am feeling. However, I can understand that changes in energy levels would result in different tension. She even compared one of my braids to one of hers using the same pattern and variables and decided the differences in the end result - which were quite marked - came down to the differences in braider. This is something to remember when collaborating with other artists - there is always going to be a difference in how each artist braids even when possible variables are the same. A huge thank you to my new friends who taught me split ply braiding and gave me the grip fid so I could continue making my (somewhat dodgy) keychain. Mary and Ruth from San Josie (thanks for the ciders and amazing olives! ), Susan (thanks for the Leatherman! I was right, my husband is very envious!) Mary, Lynn, Linda, Michelle (for your conversations and teaching) and so many others who were always willing to share expertise and experiences with this novice from Oz. And of course my always wonderful mum, Rosa, who thought she was taking me with her so I could care for her. I think she forgets that she doesn't really need a carer just yet! You all made the trip worthwhile and very memorable. Thank you! Here are our latest colouring in pages. You may download and print them out for personal use. Perhaps try printing them out on coloured paper before adding your very own colour selection! Did you know that colouring in mandalas can relax and focus the mind? Here at Infinity Creations we are all about relaxing so click on the PDF below, save and print! Happy colouring and feel free to email us your colouring results! These PDF pages have unique Infinity Creation designs ready for colouring. Best printed on card stock and once coloured, just cut them out and fold on the lines. Use some glue or tape and you have an original gift box!